There is something strange that happens when you grow up. You grow up. You graduate college, you move away from home, you get a big kid job, you meet someone special, you get married, you have some kids, and then a whole new set of adventures start. Or, if you are me, you graduate college, move to California, have a semi-full time big kid job for 10 months, move back home with your parents, go to work in a coffee shop, and watch the friends around you get married and have babies. And while this is all happening, you can't help but feel like you've been forgotten. As much as I know that I have a God who will never leave or forsake me, sometimes I feel like I completely missed an open door that He may have placed in my life. Maybe I spent too much time daydreaming about what I really wanted and I completely walked passed the open door that was going to lead me to where He wanted me to be. I really wish he would have just pushed me through that door instead. Something that I have been working on a lot these past couple of years is learning how to be content with where I am right now. Life is funny in the fact that we are always going to be waiting for something else. We waited to get out of high school, waited for that "real" job to start, waited for the right "one" to come along, waited for the wedding day, waiting for the kids. No matter where we are in life, we will always be in a waiting stage. Which makes it so, very, easy to allow yourself to sink into that feeling that you have been forgotten. That you have been overlooked. That you are going to be the only person on the planet left without "fill-in-the-blank." If you look at my life, it's far different than most other 25 year olds. Well, at least the other twenty-somethings that surround me. Everyday I probably think of something that I would like to change or something I wish was different. I argue with God constantly about where I'm at in life and why I don't have what so-and-so has. I wonder all the time whether I'm ever going to get out of this stage of my life and move into the next. I wish for so much more than what I have right now. I wait for God. I wait for his timing. I wait for his push through that open door. The real challenge is waiting patiently and contently. The challenge is finding joy in the moments that surround me now. The challenge is learning to love and enjoy the season that I'm in now. The challenge is remembering that I am not alone. You are not alone. Wherever you are right now in your life, in whatever season, you are not alone. And he is still God. He will forever and always be there for us. He will always be the one, true constant in our lives. I have a reason to worship." 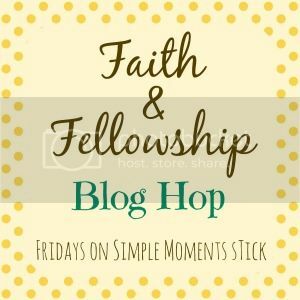 Joining in the Faith and Fellowship Blog Hop!